The khan is only a ten-minute drive from Jerusalem and is located near KfarAdumim junction, offering various types of tents for overnight campers, ecological toilets, hot showers and events. The beach will be closed for renovations from January 1, 2015 until further notice. At the northern part of the Dead Sea, just south of the new Kalia beach, is the BiankiniBesiesta beach. The beach, which some say remind them of the tranquil Sinai beaches, features lawns and trees, huts and tents. 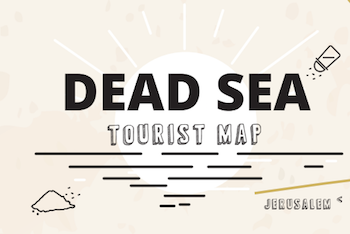 The new Kalia beach is the northernmost Dead Sea beach, located only a 30-miunte drive form Jerusalem. The Ahavavisitors center and factory outlet store sells cosmetic and body treatment products. The materials used to build the visitors center include mud, minerals and salts from the Dead Sea. Canaan Tours offers a variety of attractions in the Judean Desert: Jeep rides, ATV rides, rappelling and more. Overlooking the breathtaking landscapes of the Dead Sea Valley, opposite the Edom and Moab mountains, you'll find the Kalia Horse Ranch. The Center for Desert Tourism offers courses on rappelling from different types of cliffs, fun days for groups, manager workshops, jeep rides and more.